Wednesday, March 23, 2019. 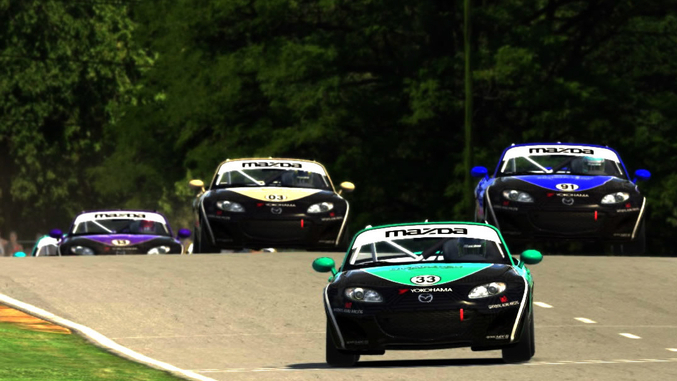 The Spec MX-5 SimRacing Challenge, a virtual motorsports competition based on the bi-coastal Spec MX-5 Challenge race series gathered at Summit Point Motorsports Park for the 2nd of 11 events in the 2019 season. 36 drivers participated in Race 1 and after qualifying 2nd, Chris Henn from Coram NY, quickly took the lead from pole sitter Robert Hartley on the first lap. Not one to shy away from a fight, Robert and Chris cleanly traded positions for several laps as the rest of the field settled in for the 20-minute race. 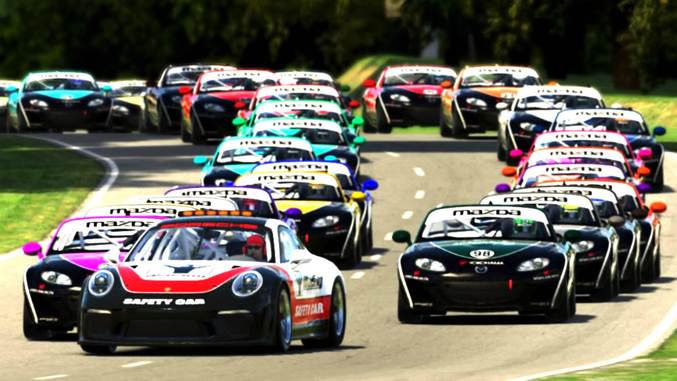 The top-5 drivers put on an exhibition of hard but clean racing… well almost. A late-braking Nathan Saxon in the #41 running in 5th punted Matt Bussa’s #34 with less than 5 minutes to go. Back up front, Chris continued to pull away from the rest of the field giving himself a 2 second lead over 2nd place Robert Hartley who was busy holding off a fast and determined DJ Alessandrini in the #91 car. Eventually Alessandrini got by the #03 of Hartley and had there been more time left in the race it’s possible that DJ may have reeled in Chris Henn and challenge him for the top-spot on the podium. Chris maintained his lead crossing the start/finish line with a 1.6 second lead over Alessandrini with Robert Hartley a close 3rd. After a short break, 34 drivers returned for the 30-minute Race 2 and surprisingly, a few of the usual frontrunners were starting further back in the field – DJ Alessandrin in P11 and Race 1 winner Chris Henn only managing P15. On the pole was Williams eSports driver, Matt Bussa and Marylander Sam Scott. Matt checked out from the get-go and put in a dominating flag to flag win. Despite his qualifying effort, Sam Scott’s race didn’t go to plan and he ended up P12 at night’s end. An incident on lap 1 involving Robert Hartley and Nathan Saxon resulted in a DNF for Hartley; this could have championship implications as the season progresses. Race 1 winner Chris Henn’s departure on lap 6 was indicative of a incident-plagued race as he toiled in the mid-pack. The few pro drivers in the series didn’t fair very well in Round 2, with Dakota Dickerson registering a DNF with a blown engine and Global MX-5 driver Jackson Robillard ending his night in the wall at T9. Twitch streamer Jake Hewitt put in another solid race; after qualifying 13th and placing as high as P4 before settling on a P7 finish. Georgia’s Jesse Stevens improved upon his P7 qualifying time to battle Nathan Saxon, Ottawa-based Jonathan Dekuysscher and Paul Darling for a well deserved P3. A little further back in the field, Ted Hough and Steve Ficacci made contact in T3 with Ficacci going off-track. While attempting to rejoin the race, Ficacci unfortunately pulled out in front of the rapidly approaching #21 car of Mitchell Peake and with nowhere to go Mitchell drilled Steve’s car. But it was Matt Bussa who quietly and confidently clicked off all 22 laps to gap the field by an impressive 7 seconds at the flag. DJ Alessandrini’s last lap pass on Jesse Stevens guaranteeing him his second 2nd place finish that night as well as the honor of collecting the most points for the event.